Craftin' Caro: MDS layout - creating a faux corner fold! MDS layout - creating a faux corner fold! I hope my fellow "March Break"-ers are enjoying the beautiful weather we're experiencing this week! 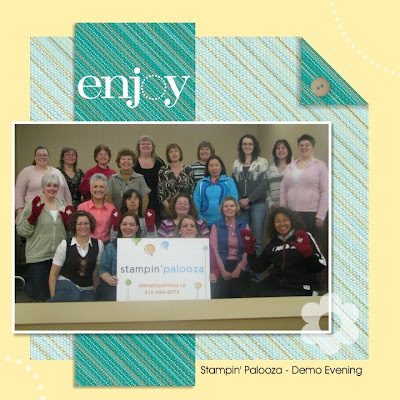 With the studio closed for spring cleaning, there isn't too much stamping to share, so here's a digital layout I created from our group picture of our Demos-Only 'Palooza night. If any of my fellow digi-scrappers want instructions on how to re-create the faux folded corner that I feature on this layout, leave me a comment below with your email so I can send it to you! I'm with Lisa on this one. Sounds about right. LOVE the look! Definitely interested in being in the know! You know I want to know!!! Yep, I wanna know! I think I may know, but.... :)Thanks for sharing! Love the page layout...I really need to get that MDS download cuz I love that paper!! I think I may know.... but not quite sure. Would love to have your instructions. Love the use of this DSP and that corner fold is perfect! Great picture and I love how you created your page. I keep thinking I need to get into MDS, but it just doesn't seem to happen. With pictures like this though, I'm more inclined to give it a try. Great page! The faux corner is awesome, especially with the button there. this looks so cool! Thank you for the offer to share. Love to know how you did it. crafts@clantownsend.org Thanks!